Transporter trailers are one of the most useful pieces of equipment you can get for your car: they serve a range of uses such as transporting your go-kart or off road dirt bike to events, and allowing car enthusiasts to collect parts and vehicles easily. 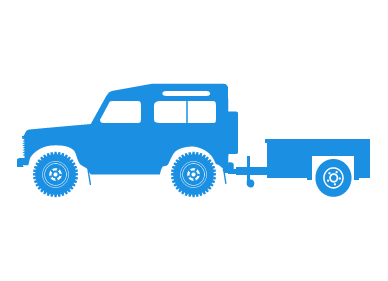 Car insurance policies can only offer third party cover when the trailer is being towed, leaving the policy-holder at risk if an accident were to happen involving the trailer. Adrian Flux's car trailer and transporter trailer cover will protect you against theft, fire, accidental damage or public liability as standard. Adrian Flux's specialist insurance team based in Norfolk are dedicated to finding customers a comprehensive insurance policy which is affordable, flexible and tailored to customers using car trailers both regularly and occasionally. Fed up of shouting at automated robots, putting you on hold and waiting in long queues? Adrian Flux only employs people to deal with our customer enquiries and is passionate about delivering great customer service. Phone our dedicated team of insurance specialists who waiting to help you find the right cover for your car trailer on 0800 587 9732 .